Dwayne “The Rock” Johnson is one of the most jacked celebrities on the planet. That’s essentially a huge reason why he is playing the son of Zeus in the upcoming blockbuster “Hercules”, set to be released in theaters on July 25. Regardless of what movie he is in, The Rock knows how to properly prepare for a role and look the part better than anyone. To look the part of Hercules, the 6’5, 260 pound movie star and former WWE superstar increased his training, using a six-days-on, one-day-off schedule for six months to help him bulk up and build even more lean muscle mass. He starts his training around 4 AM, training upwards of an hour and 45 minutes. When he is filming, he does his cardio and weight training before going to set. 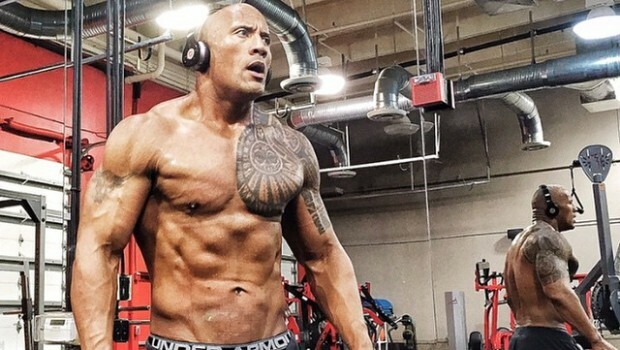 Each morning, The Rock does a 50 minute cardio session before working on a specific muscle group depending on the day. His legs are the only muscle group that receives more than one workout per week. A six-day-on, one-day-off schedule is one of the more popular workout routines for more experienced lifters. This type of routine allows you to maximize your gains while providing a set rest day to properly recover from your workouts. Exercise, especially the type of intense training that The Rock does, can put a lot of physiological stress on the body. It can lead to overuse injuries, such as stress fractures, muscle strains, and joint pain. That’s why it is essential to rest the body, which is something The Rock does at least once a week. “I love training when the sun is coming up because it allows me to put on my headphones and step off the crazy treadmill that is everyone’s life. I have my headphones on and I’m listening to my music, and I’m 100 percent focused. There’s no wasted time or effort when it comes to me and the weights,” he says. One day I’ll get the therapy I need. Until then… #HeavyIronFightsThePain #CheaperThanAShrink #NoFannyPacks My only drawback is f*cked up calloused hands. The Rock also follows an incredibly strict diet plan, especially as he prepped for Hercules. He did a full 22 week diet, eating six to seven times a day. He called his diet plan for Hercules as the 12 Labors Diet, a reference to the 12 difficult feats the mythical son of Zeus had to undertake. His dieting goal is to get enough protein to aid lean muscle growth. All his meals are very precisely measured depending on what he trains for the day. He focuses mainly on lots of protein, good carbs, and vegetables. Some of his preferred foods in his diet are egg whites, filet mignon, chicken, fish, oatmeal, broccoli, asparagus, a baked potato, cream of rice and salad, along with more complex carbs. He measures and weighs everything he eats. Some of his preferred supplements are multivitamins for general health, glucosamine and chondroitin for joint health, glutamine to aid in recovery, branched-chain amino acids to stimulate protein synthesis, and one protein shake a day for muscle growth and recovery, which he drinks after training. The Rock has a ton of protein and carbohydrates in his diet, which is both needed for proper nutrients and energy. However, many proteins are high in saturated fats that may cause cardiovascular disease, while unhealthy carbs could contribute to diabetes and metabolic syndrome, along with weight gain. The Rock mainly sticks with lean proteins and good carbs to help ensure that he gets sufficient nutrition without the downside. He takes an effective and safe combination of supplements with minimal side effects. The Rock is also known for his epic cheat days. He would go on long periods of clean eating followed by an occasional cheat day, in which he would eat everything in sight. He once had 12 pancakes, 4 double dough pizzas, and 21 brownies during one of his cheat days. He is preparing for another epic cheat day after he finishes wrapping up filming for Hercules. An occasional cheat day can have its benefits. Not only is a cheat meal psychologically satisfying and can keep you disciplined with your diet, it also causes many changes in the body that are beneficial to your metabolism. Dieting can create an energy deficit, in which your body often adapts to the shortfall of calories by burning fewer of them. Having an influx of calories with a cheat meal can interrupt this slowdown. In addition, dieting can decrease levels of thyroid hormones and leptin (which directly affect fat-burning) and IGF (insulinlike growth factor, which supports muscle growth). Having an occasional cheat meal can bring them back to normal.